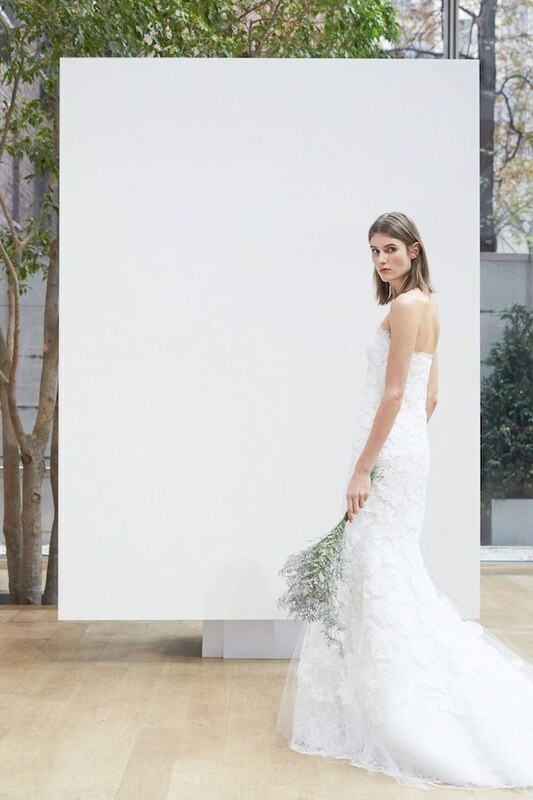 For their first bridal collection as creative directors for Oscar de la Renta Fernando Garcia and Laura Kim continued with the late desginer’s legacy and love for flowers. “We kept some Oscar-isms, like sashes and ferns and foliage as a strong base for embroideries, because he loved gardens so much,” Garcia said. “But we’re making it much lighter and more relaxed,” Kim added. Among floral guipure lace, silk tulle with jasmine embroidery, Chantilly lace with anemone appliqué and stretch silk georgette, there were modern column gowns, ballgowns, a suit with a silver sequin corset and lots of illusion necklines. The designers surprised everyone with a less conventional bridal look which Kim called “Ode to Sarah Jessica Parker”, with a white denim jacket embroidered with “Just Married” across the back over a white, tea-length tulle ball skirt embroidered with the Oscar de la Renta signature across the hem.